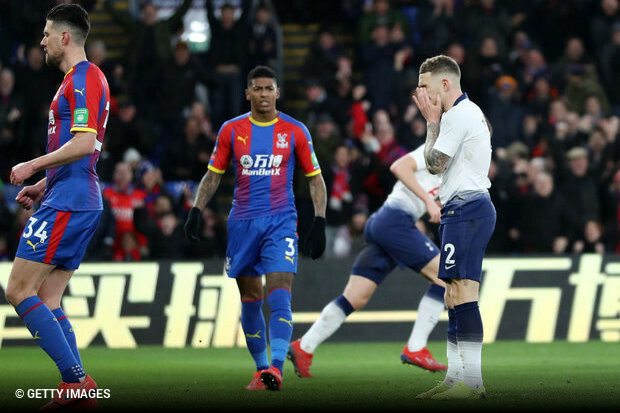 Tottenham went out of their second knockout competition in four days after defeat by Crystal Palace (2-0) in the FA Cup fourth round at Selhurst Park. Connor Wickham (9) set Palace on their way with his first goal in 799 days, before Andros Townsend (34) haunted his former club by doubling the hosts' lead from the penalty spot after Kyle Walker-Peters' inexcusable handball. Spurs missed a penalty before half-time when Kieran Trippier blazed wide. The victory sees Palace secure their place in Monday's fifth-round draw at the expense of Spurs, whose trophy hopes took another significant dent after Thursday's Carabao Cup exit at Chelsea. Roy Hodgson: "For Connor, to play and crown it with a goal, that's good news. We can leave Selhurst Park with a smile on our faces and see what awaits us in the fifth round. I believe and hope he can make a contribution, but that would be putting an awful lot of pressure on him." Mauricio Pochettino: "We feel disappointed with the way we conceded. Palace didn’t do too much, but they scored. Disappointed because if you play bad, of course, you don’t deserve, you’re more relaxed, but this type of game, you dominate, it’s so disappointing and painful to lose like this."